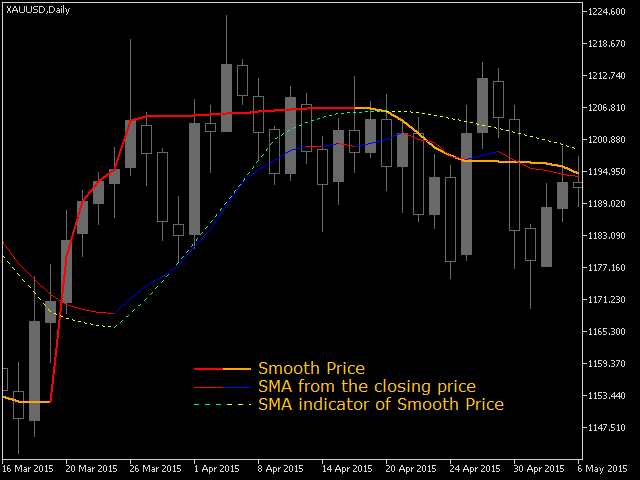 The Smooth Price technical indicator is used for plotting a smoothed line as close to the price of the financial instrument as possible, and serves to eliminate its noise components. 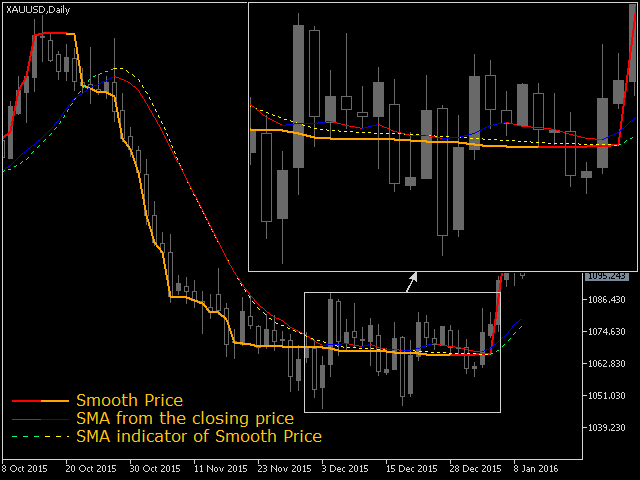 The indicator is part of the Monarch trading system, but here it is presented as an independent technical analysis tool. The indicator is based on the cluster digital filter, which, unlike the ClusterSMA, is applied directly to the price time series. 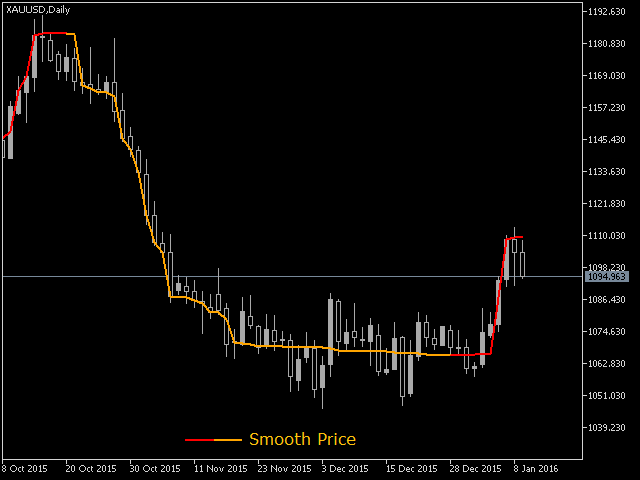 Smooth Price does not redraw (except the very last, zero bar) and is an improved version of the famous similarly named indicator. Features of the cluster filter based indicators are described in the author's blog. No delay on a formed trend. Gently smooths noise movements of the price. Indicators, based on the Smooth Price instead of the price, contain less false signals (see screenshots). Sensitivity - indicator sensitivity, can have values from 0 to 255. The highest sensitivity is at the zero value - the indicator replicates the price movements. The lowest sensitivity is at value 255 - the indicator algorithm tries to eliminate noise movements of the price as much as possible. Default value is 0. The maximum limitation of 255 has been introduced due to the "heavy" calculation part of the cluster filter. Max bars in chart - the maximum number of bars, that are calculated and displayed in the indicator's window during the product's start or re-calculation. The default value is 256 bars. This greatly speeds up the preparation of the indicator for trading and testing. If 0, the indicator is calculated at the entire available history. The minimum amount of displayed bars is three. Every tick - the indicator is re-calculated at every tick on the last unfinished bar. Use this mode if the indicator readings are important on this bar. Every new minute bar - the indicator is re-calculated on the last unfinished bar only when a new bar arrives on the M1 timeframe. It is recommended to use the mode on timeframes exceeding M1. This reduces the load on CPU and allows tracking changes in the indicator readings once per minute. Every new bar - the indicator is re-calculated at the last unfinished bar only when a new bar arrives on the current timeframe. The indicator values on a new bar are often disregarded when defining a signal for a trading system. By selecting the option, you can significantly reduce the indicator calculation time in actual trading, as well as during strategy tests. Color up - upward line color. Color down - downward line color. Style - line drawing style. When the "Width" is set to 1, apart from the Solid line, you can also select Dash, Dotted, Dash-dot, or Dash - two dots. Bar of alert - the number of the bar on which the signal is checked (0 - the last unfinished bar). 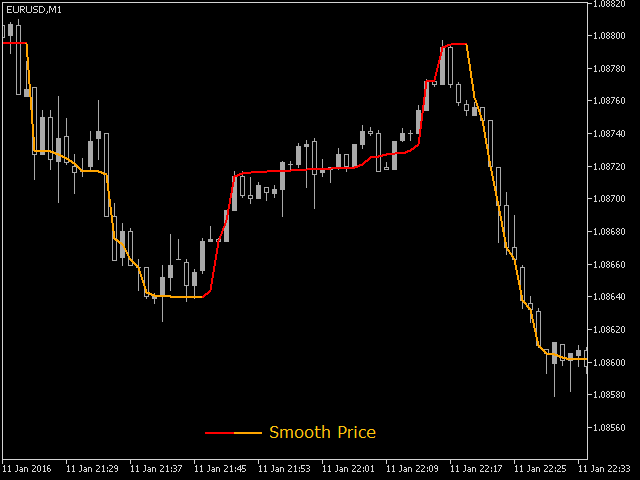 Signals are generated when the trend of the indicator line changes. If "Bar of alert" is greater than 0, then the signal will be generated only if the indicator moves in the same direction on the specified bar and all the subsequent bars. Thus, the signals are only generated during a steady trend and are ignored in all other cases, to reduce false triggers. Sound - enable/disable sound alert. Log - prints the signal message into the log. Alert - generates a sound alert, prints a message about the signal to the dialog box and to the log. Mail - sending an email using an address specified on the Email tab of the options window. Notification - sends a notification to mobile terminals which have their MetaQuotes IDs specified in the "Notifications" tab of the terminal settings. Smooth Price – второй продукт, приобретенный мной в Маркете, про который можно сказать – это профессиональный индикатор. В 2014 году мне еще понравился ChartBuilder от Навойкова. Ранее автор Smooth Price написал для меня ряд сложных индикаторов, которые я успешно использую в торговле. Аренда Smooth Price увеличила мою торговую прибыль на 15-20 процентов и сэкономила несколько миллионов нервных клеток. Ведь я всегда вижу направление тренда. Мне, как и, наверное, всем трейдерам хочется, чтобы снизилась цена на Smooth Price и.. на Lamborghini. Что между ними общего? Элитарность и качество в каждой детали. В чем отличие? Smooth Price может позволить себе каждый. релиз которой не за горами, вдруг замечаешь, что домашние супы стали вкуснее, а супруга взяла абонемент в фитнес-зал..
Исправил ошибку для МТ4 в режиме тиков - пересчитывался только при открытии нового бара. В режиме "Every tick" изменил порядок расчета. Раньше пересчитывался каждый тик, теперь пересчитывается только в том случае, если в тике изменилась цена Bid. Из-за уменьшения количества перерасчетов получили ускорение в режиме "Every tick" при одинаковом результате. Fixed mode "Every new minute bar" in the parameter "Recalculation of the last bar", which didn't work in the strategy tester.